You will Watch One Piece Episode 449 English Dubbed online for free episodes with HQ / high quality. Stream anime One Piece Season 13 Episode 28 Magellan’s Tricky Move! A Foiled Escape Plan! Luffy becomes enraged after learning about Magellan defeating Ivankov and Inazuma, but Mr. 2 and Jimbei persuade him that escaping takes priority. 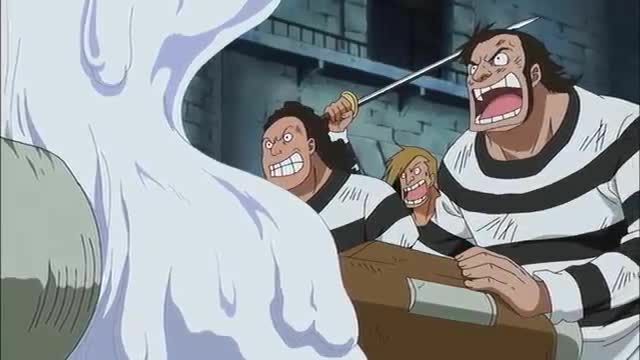 Magellan initiates a plan to move the Marine ships away from Impel Down, trapping the escapees in the prison. Mr. 3 blocks Magellan’s poison with his wax, giving Luffy the idea to have him coat his fists and feet with wax so that he can hit Magellan without being poisoned. Jimbei finds a way to reach the ships by floating Buggy, Crocodile and Mr. 1 on a door and creating a sea current to launch it onto a battleship.